Please note that the content of this book primarily consists of articles available from Wikipedia or other free sources online. 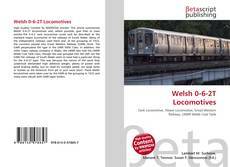 This article summarizes Welsh 0-6-2T locomotives and, where possible, give links to main articles.The 0-6-2 tank locomotive could well be described as the standard steam locomotive of the railways of South Wales. Many of the independent railways used them and, at the grouping of 1923, the survivors passed into Great Western Railway (GWR) stock. The GWR perpetuated the type in the GWR 5600 Class. In addition, the other major railway company in Wales, the LNWR also had the LNWR Webb Coal Tank Class, though this was grouped into the LMS not the GWR.The railways of South Wales seem to have had a particular liking for the 0-6-2T type. This was because the nature of the work they undertook demanded high adhesive weight, plenty of power with good braking ability, but no need for outright speed, nor large tanks or bunker as the distances from pit to port were short. These Welsh locomotives were taken over by the GWR at the grouping in 1923 and many were rebuilt with GWR taper boilers.